Sasha Jackson Mysteries : I ain't no Picasso! 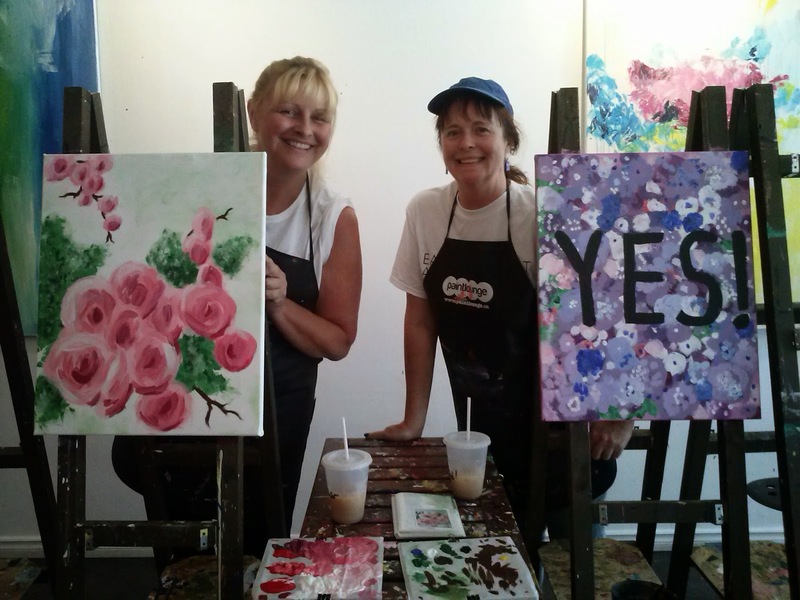 The latest trend around Toronto seems to be drop-in art studios, painting workshops and themed "Cocktails and Canvas" events at bars/pubs around the Greater Toronto Area. (Painting as a social thing, in a bar doesn't appeal to me at all - I prefer a quieter environment when it comes to being creative). Now, like so many other things, I quite enjoy painting (with acrylics) despite my obvious lack of talent. Years ago, a roommate and I used to work on canvases together whenever we were bored. Every picture we made was awful and sooner or later they all ended up in the garbage. I realized that lately I've missed painting, missed getting in touch with that type of creativity. 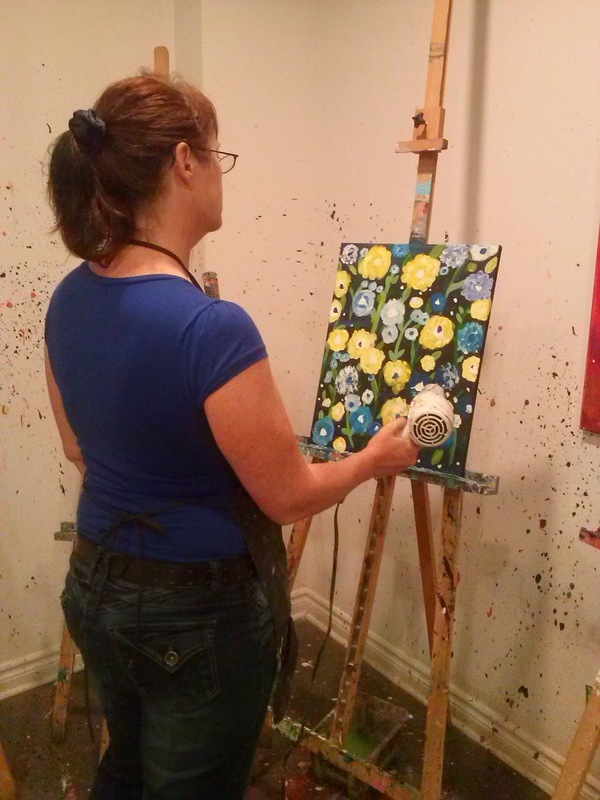 So, when I discovered PAINTLOUNGE, I immediately signed up for a couple of workshops. 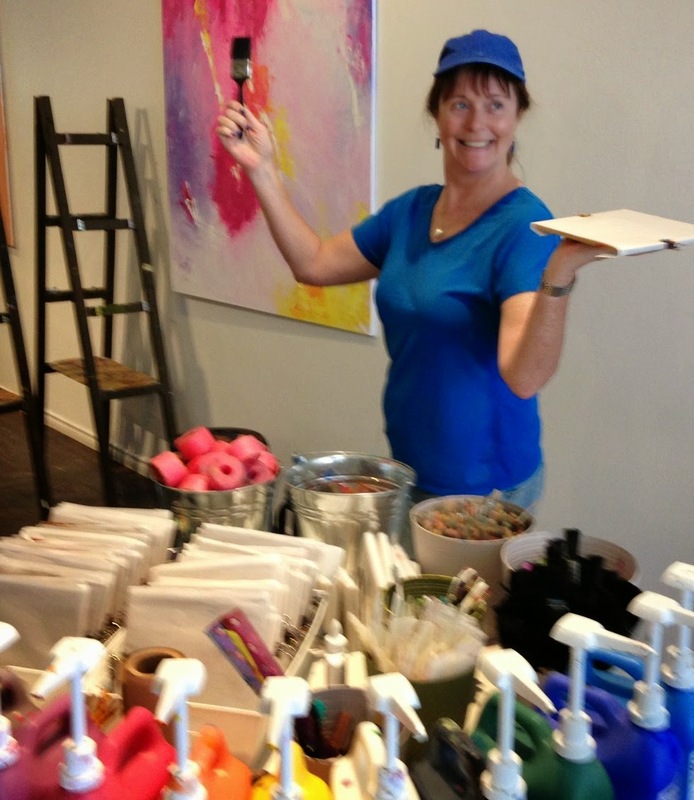 Now, PAINTLOUNGE is not quite "Paint By Number" for grown-ups... They give you a sample picture (rated by skill level as "easy", "moderate" or "challenge") and suggest colours and approaches, but you can put your own spin on it. (You can also go in for solo work and do your own thing.) They supply all materials, and it's no big deal if you spill some paint here or splash a few drops there - BONUS! Using a blow dryer to get the background to dry more quickly. 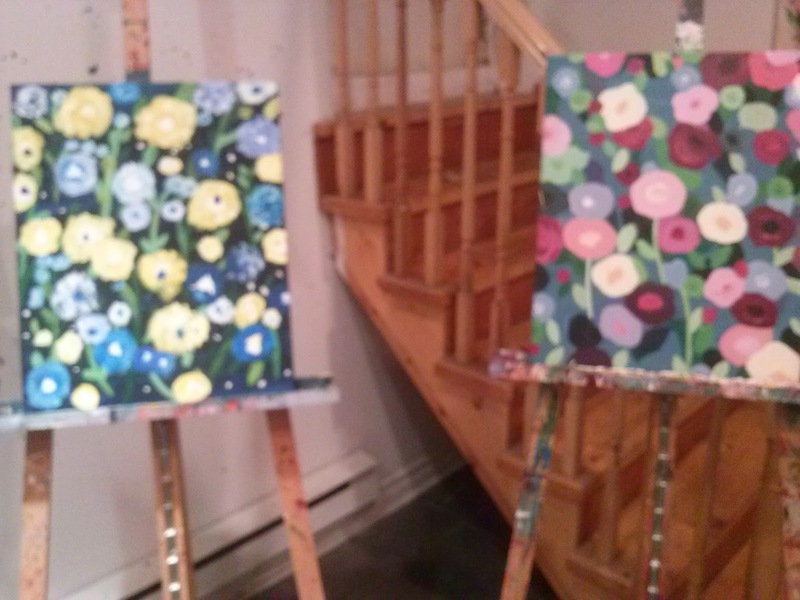 This was Monday night's masterpiece (my picture is on the left). I wish I had done the background stripes differently - fewer colours and wider bands. Also my birds look fat, especially the one on the far right! Again with the blow dryer (but this is from Tuesday night's session). I plan to keep up with this whenever I have time (PAINTLOUNGE is not too far from where I live). I find it totally relaxing and the time just flies by. I doubt that I'll ever paint anything worthy of framing (never say never), but prowess isn't the point - having fun and zoning out for a few hours is. 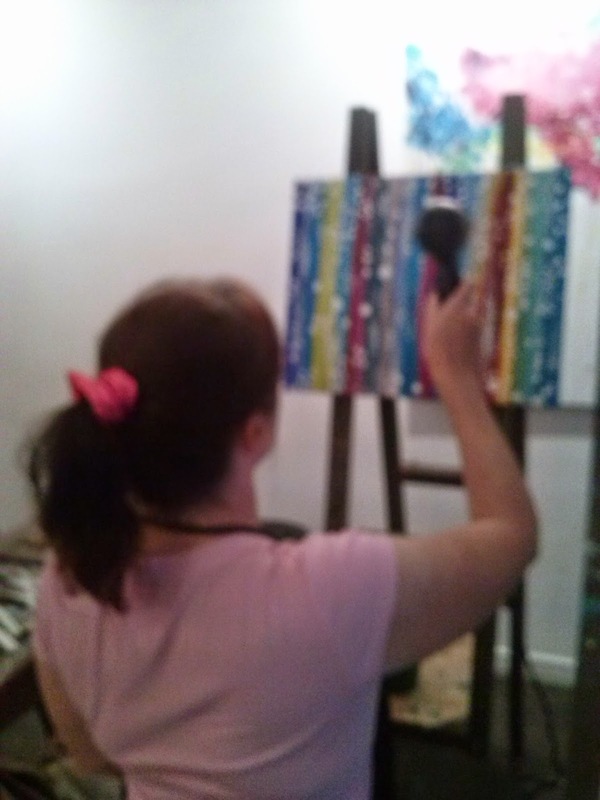 UPDATE - August 22nd: I had so much fun the first couple of times I went to Paintlounge that I returned today and brought my friend Katrin with me. 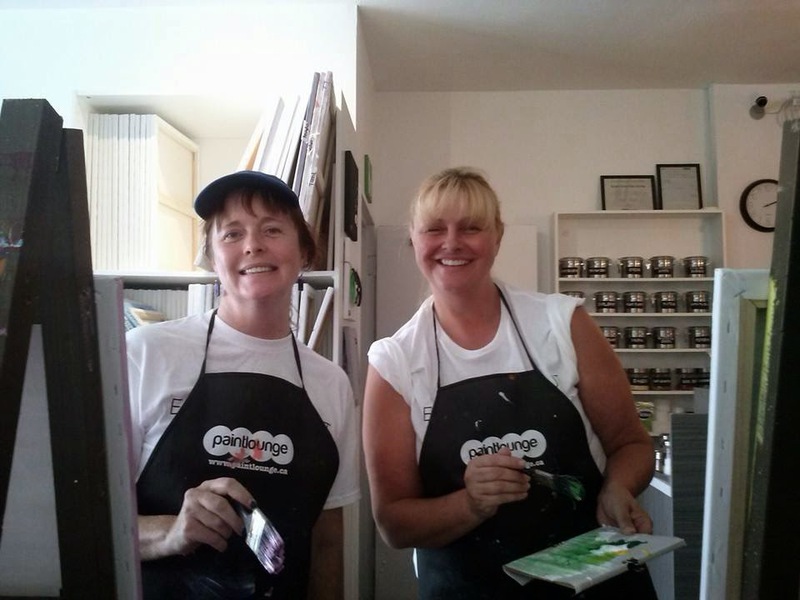 Before changing into painting T-shirts and smocks. Yeah, we totally rocked it! I think you have talent, Jill! 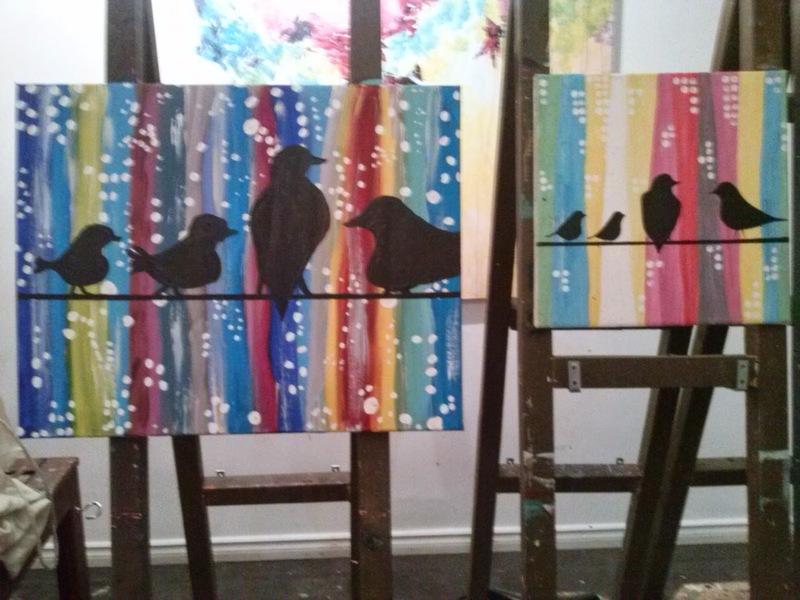 My favourite is the one with the birds. Looks like they're enjoying the first snowfall of the season. Quite wonderful, Jill! I find that visual arts re-connect me time and again to the writing. Visual arts are so immediate and accessible. They open up the creative valves.